This important guide to clinical practice was first articulated by Hippocrates, the Father of Western Medicine. For example in the case of fever, Aspirin, Tylenol, Ibuprofen, and other ‘anti-fever’ drugs have been shown to prolong viral infections and increase their transmission while doing nothing to shorten the severity of the infection. 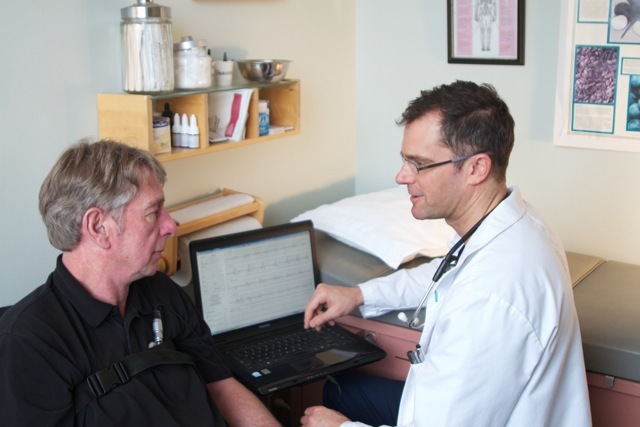 Naturopathic Physicians minimize this type of treatment while providing relief to the patient. Symptoms of disease are the tip of an iceberg. The disease itself lies below the waters. If we treat only symptoms than we are not making people well. For example, in infections, fevers are a symptom and not the disease. In fact the fever is a response by the body to improve our ability to fight the infection. By observing your unique individual patterns of symptoms and your genetics we can understand the unique strengths and weaknesses of your body and how to best support you. For example research has shown that people with asthma who have blue eyes have a different biological reaction driving the symptoms as compared to a person with brown eyes. The symptoms look the same on the surface but are actually quite different underneath. Education is a mainstay of Naturopathic care. Our patients learn about health and how to cultivate health. Many patients, as they take treatments and become more healthy, educate others in their community of families and friends. Some patients so dramatically improve that they become beacons of health that are sought out to explain how they have regained their health. Prevention is not just a blood test or annual physical. It is actively taking part in cultivating and building health, it is a responsibility to ourselves we all have. Naturopathic treatments incorporate this principle by strengthening the body. We are a part of nature and an abundant Creation provides a tremendous wealth of powerful healing agents. Our bodies possess self healing capabilities at all times and our duty as physicians is to strengthen and improve these mechanisms of innate healing.